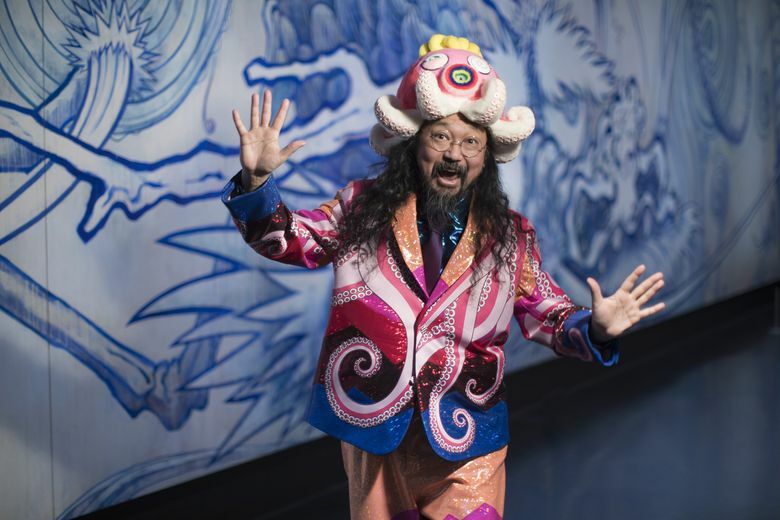 Wildly popular exhibition of Takashi Murakami’s art opens Saturday in Vancouver, B.C. For Seattle-area residents, it’s well worth the trip over the border to see the only West Coast stop of this important retrospective of Murakami’s multi-tentacled creativity. 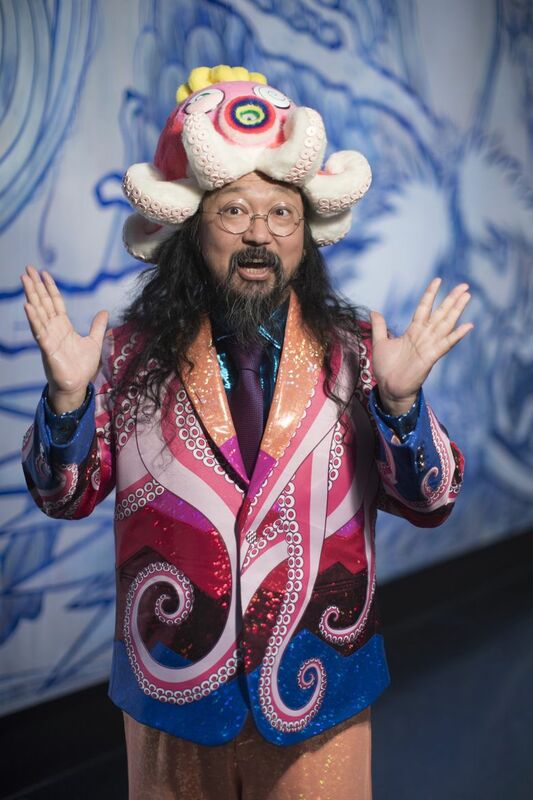 Consider the title of the wildly popular exhibition of art by Takashi Murakami: “The Octopus Eats Its Own Leg.” This frightening, gripping phrase — drawn from Japanese folklore — suggests insatiable consumption, instinctive survival and, ultimately, regeneration. After all, the octopus’ leg regrows. 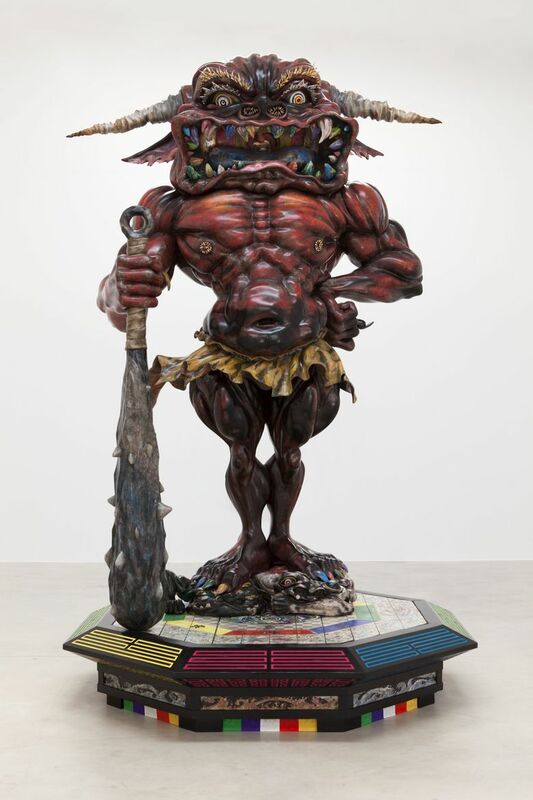 For the internationally famous Japanese artist, it’s a metaphor that also fits his creative practice, the way his psychedelic-pop paintings and polymorphous sculptures seem to feed off themselves, recycling his favorite motifs and mining imagery from anime culture and Japanese art history while morphing into new ideas and forms. The exhibition, organized by the Museum of Contemporary Art (MCA), Chicago, where it shattered attendance records, opens Feb. 3 at the Vancouver Art Gallery, its only stop on the West Coast. For Seattle-area residents, it will be worth the trip over the border to see this important retrospective of Murakami’s multi-tentacled creativity. 10 a.m. to 5 p.m. daily, Tuesdays until 9 p.m., Feb. 3-May 6 (extended hours 10 a.m.-9 p.m. Feb 3-4); Vancouver Art Gallery, 750 Hornby St., Vancouver, B.C., Canada (604-662-4719 or www.vanartgallery.bc.ca). You might already be familiar with Murakami’s work, if not from his rising popularity since the early 2000s, then perhaps from his projects with Louis Vuitton, Vans, Issey Miyake and ComplexCon, as well as collaborations with musicians Kanye West and Pharrell Williams. 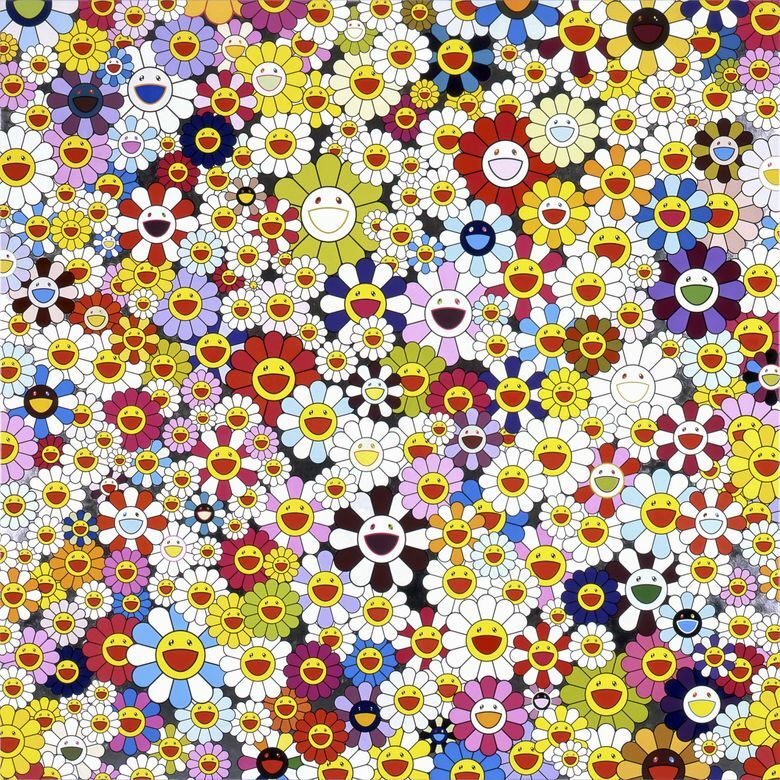 Murakami’s exuberant disregard for distinctions between fine art and pop culture, and his employment of dozens of people to help him in his creative endeavors, have led to comparisons with such Western artists as Andy Warhol and Jeff Koons. Similar charges of cynical commercialism have been lobbed against all three artists. Murakami says that, in fact, he’s directly addressing capitalism in his work. The Vancouver Art Gallery exhibition, which surveys over three decades of Murakami’s career, is primarily focused on Murakami’s painting — with some sculpture, commercial products, and process material mixed in. His now rarely seen paintings from the 1990s show the development of his style, borrowing heavily from anime and manga as well as the high art form of Nihonga, the traditional Japanese style of painting, in which Murakami has a Ph.D. from the Tokyo University of the Arts. Around this time, Murakami developed his “Superflat” theory and, in 2000, curated a group exhibition with that title for the Museum of Contemporary Art, Los Angeles. Most of Murakami’s paintings proclaim his Superflat theory in the way they flatten boundaries between high and low culture and emphasize two-dimensional figures and compositions. 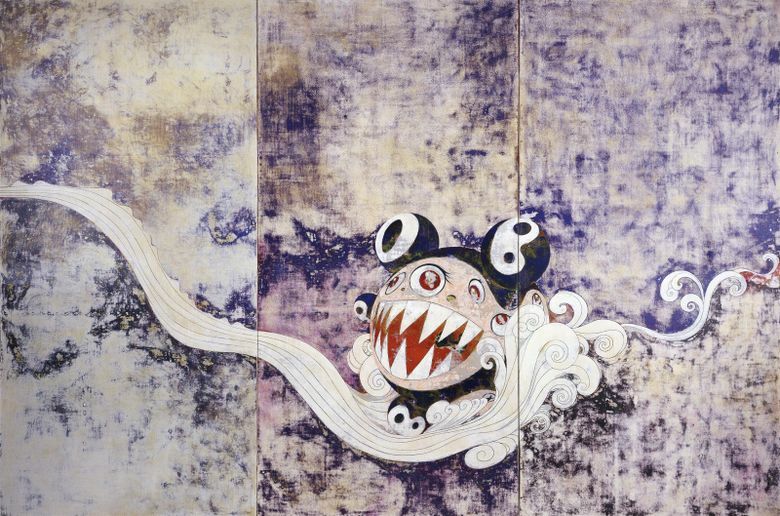 Murakami delved further into Japanese art history, collaborating with the Japanese art historian Nobuo Tsuji to explore new takes on traditional themes: screens and panels, dragons and serpents, Buddhas and lotuses. In a 2016 interview for The Japan Times, Murakami pointed out other reasons for the changes in his work: the 2007-2008 global economic crisis and the environmental and human-caused disasters that took place just a few years later. The Fukushima nuclear-plant accident, which stemmed from the tsunami, also had a major impact, forcing so many Japanese to consider the threat of radiation exposure. Murakami was thrown into contemplation about life, death and art’s role in the midst of calamity. Murakami also considered the intersection of religion and art, a deeply important historical relationship often neglected in the contemporary art world. He began to populate his enormous paintings with arhats, considered to be disciples of Buddha who spread his teachings. In Murakami’s hands, of course, the traditional figures became stylized and even monstrous, with Technicolor robes and cartoonish, grimacing smiles. Murakami’s work continued to evolve and relapse on itself. Alongside the paintings of gruesome figures and multifarious skulls, old motifs proliferated: hallucinogenic smiling flowers, anime heads and new takes on Mr. DOB, his Mickey Mouse-like character from the 1990s. The exhibition brings us up to the moment, with three large-scale paintings created specifically for the Vancouver show (and delivered just days before the opening). Additional new, site-specific work is transforming the gallery with a 50-foot-tall sculpture within the rotunda and a huge public art piece for the exterior. And, of course, the gift shop will be chock-full of Murakami-designed and related merchandise. Murakami has often said he does not differentiate between fine art and mass-produced commercial items, that they all swirl through the rapid circulation of our capitalist, image-driven culture.